Two Nationalist Party members of the European Parliament have shown no compunction about painting Malta as a country that does not respect the rule of law. Instead of representing Malta’s national interest abroad, they have sought to undermine it. Roberta Metsola, an ambitious aspirant to the PN leadership, wrote a few months ago about her intention to hunt down countries that failed to come up to the standards set by “European values” on the rule of law, while hypocritically staying silent about the undemocratic attack on the rule of law in Hungary by Fidesz, a party in the same political grouping as the PN in the European Parliament. In her latest sally into this field (‘Pieces of the puzzle’, November 20), she accuses those who are critical of Nationalist MEPs of “a thwarted and misplaced sense of pseudo-nationalistic pride”. I read her piece with incredulity. 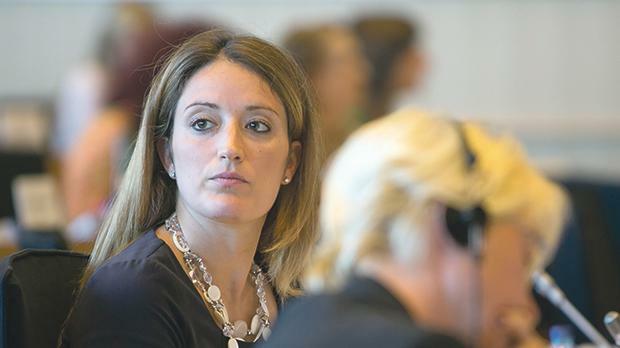 Was this Euro-parliamentary representative of Malta serious? It was difficult to discern what the article purported to achieve. It was either a sixth form paean to truth or Metsola’s coy attempt at the dance of the seven veils as she tantalisingly revealed layer after layer of what she regards as the Truth (with a capital T) about… about what? She never actually tells us. “Truth,” she reveals, “is what it is”, adding bathetically, “it is always there breaching the surface spectacularly like a whale and, at other times, showing itself in instalments, completing the mosaic or jigsaw puzzle, bit by painful bit”. “Painful”? A riot of mixed metaphors. But those who stick gamely with her 400-word essay will not be surprised to learn that the words that dare not speak their name in Metsola’s turgid article are 17 Black. Let us, therefore, examine the known facts about 17 Black, not Metsola’s farrago. The Financial Analysis Intelligence Unit has identified Yorgen Fenech, director and CEO of the Tumas Group, which forms part of the Electrogas consortium that won the multi-million euro government concession to build and operate the new gas power station, as the owner of 17 Black in Dubai. Fenech is the account’s sole signatory. He has not denied ownership of 17 Black. 17 Black had originally been identified in the Panama Papers as a target company for Hearnville and Tillgate, two companies set up by Konrad Mizzi and Keith Schembri in 2016. No trace of fund transfers between 17 Black and the two companies has been established. Both men have denied that the companies have ever held bank accounts or that they traded. The Malta police force has been investigating the ownership of 17 Black “and other persons” since the FIAU raised their concerns about it last March. The probe began the same week the police received an intelligence report naming Fenech as the owner of 17 Black. The criminal investigation has prompted the involvement of Magistrate Charmaine Galea. (This is quite distinct from the magisterial inquiries into Schembri’s alleged kickbacks and money-laundering that had been instigated by Simon Busuttil). Do these known facts justify Metsola’s dramatic declaration? She states: “The indicators are there and getting stronger and more damning by the day. This is being countered by more muddying and obfuscation, more in-your-face defiance of accepted norms of public behaviour and decency”. In a phrase I utterly reject as a regular columnist, she speaks of “an ever-increasing suppression of the role of the free press in our country”. If there had not been a police inquiry coupled with magisterial assistance under way, I would have tended to agree with her. But what she says flies in the face of the evidence. Truth is either evidence-based or it is nothing. The wheels of justice are grinding onwards unhindered by the government. The rule of law is running its course as it did so ineluctably and, in the end, melodramatically in the Egrant inquiry. Instead of adopting a circumspect approach to 17 Black as most grown-up politicians would do – and, as a lawyer, respecting due process and the presumption of innocence until proven guilty - Metsola has embraced the enthusiastic gullibility of consumers of unsubstantiated news, thus allowing the very concept of objective truth to be sidelined. Let me repeat what I said two years ago, and have said many times since. Although the Prime Minister set his face against any talk of resignations in 2016 on the grounds that nothing technically wrong had been proven, I am clear that Mizzi and Schembri should have been invited to stand down from their posts pending further investigations since a gross breach of the convention of ministerial responsibility and an official’s accountability had been committed. That still remains my position today. But that is markedly different from deciding they are guilty of criminal wrongdoing as Metsola has implied. Education should teach us to reach conclusions through a measured examination of factual data, not some half-baked tribute to truth. Metsola is allowed her own opinion and the luxury of wishful thinking. But she is not entitled to esteem instinct over rational assessment and to create her own facts in the absence of evidence to back them up. For that we have to await the outcome of the police and magisterial inquiries. If we deny and ignore well-established, scientifically-verified evidence, then we are simply believing fake information and allowing emotions to trump both facts and logic. Metsola’s disregard for the evidence – her displacement of reason by emotion and the corrosion of language – has diminished the very value of the truth she struggled to write about in her article. The misplaced conviction of jejune politicians like Metsola is that, out of the twisted timber of the Labour government, nothing straight can ever be fashioned. No society is perfect and we need to work relentlessly to fix Malta’s problems. But for Metsola and her wide-eyed followers there is no context, no nuance. Just those who oppose and those who resist. And the solution is always to run down the country, rather than work for constructive reform. Either that, or they must reckon that if you feed the reading public, including some readers of this newspaper, enough negativity, they might actually start to believe it.